There is so much to say about the wonderful city of Ghent, I hardly know where to begin. It’s a city about the size of Plymouth (where I work) and it couldn’t be more different. It’s flat for a start! Flat, of course, makes it nice and easy for cycling and it was truly wonderful to see so many cyclists scooting about – how I miss my bike. This combined with the many cobbled streets acted as a form of traffic calming and presumably a car deterrent – so much of the old city was car free – bliss. To my shame, the only things I could recall about Belgium (other than chocolate, biscuits and beer) was – ahem – Hercule Poirot and a rather hazy recollection of a poem about bringing good news from Ghent. On investigation, it turns out that Robert Browning’s poem, How They Brought the Good News from Ghent to Aix doesn’t actually refer to any historical event – a complete red herring in fact. I have to say, having spent a week in Ghent, I’m not much the wiser. However, I did glean a few facts. Ghent was (and by the amount of rebuilding and refurbishment going on I assume it still is) a wealthy city surrounded by fertile plains. 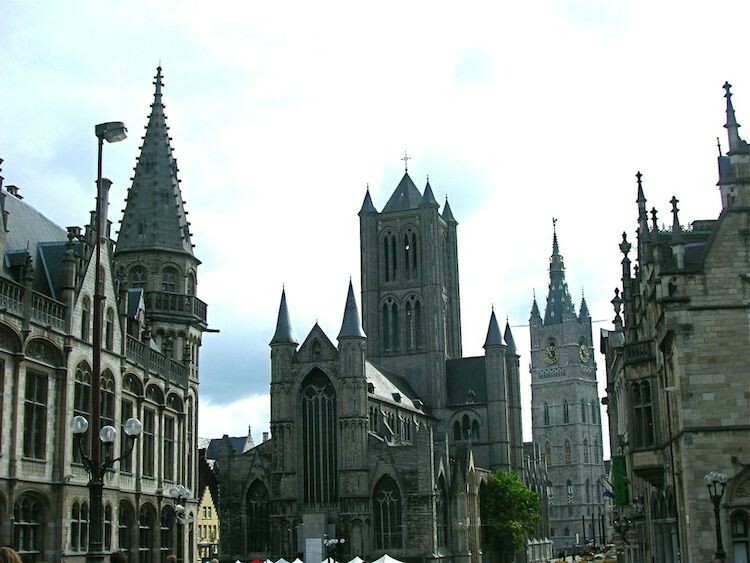 In the 1340s, Jacob van Artevelde was forced into siding with the English during the 100 years war, which ensured Ghent was largely untouched by the devastation which affected much of Northern Europe. His statue now ordains the Friday Market Square in Ghent and he is now much reveered, despite ending up being killed by an angry mob. As an aside, it transpires that the renowned John of Gaunt, virtual ruler of England in the 1370s was in fact born in Ghent. The end result of all this wealth is the most amazing and interesting architecture I think I’ve seen in an average sized European city. The sheer number of enormous buildings in themselves is breathtaking, castles, monasteries, cathedral, churches, guild houses, operas, theatres and more. The photographs I’ve included here are only a very small selection. But it’s also interesting as architectural styles are very different and no two buildings seem the same. Our hotel was conveniently situated in the Town Square. As soon as we’d dropped off our luggage, we went out to explore the Square which involved much oohing and aahing over the St Bavo’s Cathedral, the Belfry Tower and the Royal Dutch Theatre. Having just reviewed the photos we took, I’ve realised that neither of us took a picture of the cathedral – honestly! We managed a peek at The Adoration of the Mystic Lamb painted by the brothers Van Eyck but somehow failed to see the Rubens. It was here I spotted my first chocolate shop – the first of many. Really, it was astonishing just how many and varied they were. So many beautiful displays and most looking exceedingly tempting. The only one I couldn’t bring myself to go into was one featuring a window full of fluffy bears sitting amongst the chocolates. As well as the pralines and truffles one expects from traditional Belgian chocolates, there were lots of more unusual offerings. Tea flavoured chocolates seemed to crop up in quite a few places. Coconut and black Cavendish tobacco in a special white chocolate from the Dominican Republic. These didn’t come in a beautifully wrapped box, but in a Japanese style plain envelope, which suited them admirably. Having made my purchase Nicolas then offered me one on the house to eat then and there. I went for the all dark, which although it had no additional flavouring, was very good indeed. All of the ganaches were dairy free being made with soya. This, Nicolas claims, gives a much lighter texture than cream; I can report that the consistency was very good. Hoorah, vegan friendly chocolates, which meant my vegan work colleague wouldn’t have to miss out on the goodies as he normally does. I thought these were really fun and very interesting, but being a dairy girl at heart, these would never be my chocolates of choice. Unfortunately, the poor exchange rate meant everything in Ghent was really expensive so I didn’t indulge as much as I might have otherwise done. And, of course, I did have to bring a few presents back. One of the most delicious sweet treats I had were these famous Ghent cuberdons. They are made from raspberry puree which has a shelf life of only 4 weeks. Traditionally, these are cone shaped, firm on the outside and soft on the inside, but we bought some particularly interesting ones which were a house speciality. Hot chocolate was not forgotten and we sampled a couple of these, one in a cafe and the other in a chocolate shop – guess which was which! Both were really good, but if truth be told, I think we both enjoyed sitting outside the cafe in a little square sipping our plain chocolate. Another very pleasant surprise for me was the number of vegetarian cafes and restaurants to be found. I sampled three of them and saw a couple of others I’d like to have tried. It’s not often I go to places and get spoilt for choice. All of the meals I had were good, but two of them were exceptional, featuring one of my favourite foods, tempeh. Lunches served at the conference were also mostly vegetarian and again very good. Little did I know I was going to a vegetarian foodie mecca. However, Ghent is even more progressive than this – it promotes Vegetarian Thursdays where over 100 restaurants offer either an exclusive vegetarian menu or at least a good choice. Hospitals, schools and local government offices also participate in a bid to encourage healthy eating and food sustainability. A post about Belgium would not, of course, be complete without mentioning the beer and I’m sure VegBoxBoy would be most disappointed if I didn’t. Not being a great beer drinker, I didn’t go wild, but I did manage to sample a few different beverages and very nice they were too, with a spelt beer being my favourite. You can see from the photograph that it could take some time to work ones way through the many varieties that are on offer in Belgium – over 800 I believe and that doesn’t include the specials. The conference over, I had to look for accommodation in a cheaper establishment. It was a bit hit and miss as I plumped for the first place I could find on the internet that looked reasonable and was not already booked. I chose Beatrice and Marcus B&B which was about a 20 minute fast walk from the Town Square. Luckily, it was delightful – so much nicer than the bland corporate anonymity of the chain hotel we had been staying in. Our Flemish hosts were very friendly and helpful, we had a large room, a lovely comfortable bed and an ample yet delicious breakfast which included home made jam. Well beyond the call of duty, Marcus drove us to the train station on the morning of our departure as we were concerned that the buses might not be running due to the extensive road works being undertaken. There is so much else to say, this post risks being rather too lengthy and verbose, but I will just mention that Ghent had a really good botanic garden belonging to the university, CT was impressed anyway and spent the best part of a day there and then took me to see it later on in the week. You may like to see his post on the visit. I was lucky enough to see a performance of Shake That, courtesy of the conference. This was a sort of humorous juggling act performed by five Ghent lads using bottles, cocktail shakers and fruit. In addition Ghent was hosting a jazz festival during our stay and whilst neither of us are big jazz fans, we thought we should put in an appearance. It was held in the park so we attended on our last evening. The band was good and the atmosphere was nice and friendly – a pleasant way to take our leave of this wonderful city. Wonderful post Choclette! So interesting and now I want to visit Ghent. Glad you enjoyed it. What a lovely post and not at all rambling. I am very jealous of all that chocolate activity, particular that lovely cafe hot chocolate! The B&B sounds a wonderful find. I hope that darned conference didn’t interfere too much. BTW, sorry about the weather this week, I seem to have cursed it for you, I hope you are enjoying yourself regardless of rain or shine. Right! That’s it!!! I’m packing mybags and heading off on holiday …. I WISH! Best I have is 3 days in Aberdeen at the end of this month for a friends wedding, nothing as wonderfully exciting and magical as a week in Ghent I’m afraid. Love your photos! You managed to fit so much in, I thought at first that it was a holiday, not work related! The chocolates from Yuzu sound amazing. Quite right, I would’ve been most disappointed if you’d not sampled a cheeky beer! Lovely post, can I say it too? I enjoyed that hugely. It’s not that far to go, I wonder if we should just pack a bag. We’ve been to Bruges and to Brussels, but this looks even nicer! Maybe I’ll bump into all your readers there. EVOO Is Extra Virgin Olive Oil! You have a cool foodblog!! I love Gent. It is in Flanders. I am a Flemish person. We love also Gent. It is a great & grand city! thanks for sharing this with us! Kath – you’re always so generous with your comments, thank you. I do find it a bit difficult to gage how much to say in these posts, I know I don’t generally have time to read lengthy posts. I just couldn’t help myself with this one and could quite happily have gone on for quite a bit longer – so many photos too. We missed the week of sunshine you predicted for when the kids went back to school as it rained much of the time we were away and has been raining pretty much since we got back – hey ho, I’ll try not to blame you. As for the conference, we wouldn’t have gone without it, so can’t really complain. Lucie – thank you. I will now be urging everyone to take a trip to Ghent. Chele – Aberdeen sounds pretty exciting to me never having been there and I’m sure you will enjoy the wedding. Suelle – well I did get the evenings and then we stayed an extra couple of days, but really there is so much to see. I’ve just been reading reviews on the web about Yuzu and it seems to be quite highly rated. Sushma – thank you, I had to restrain myself from putting in loads more. Liz – I did think of you whilst I was there, sitting in the square with your hot chocolate, watching the world go by. It seems to be a very happening place. Celia – you say such lovely things. I was very impressed with the Vegetarian thing and everyone we spoke to know about it. I’m rather vague about how the soya was used, but he was certainly a fan. VegBoxBoy – you’re keeping very quiet on what exactly you were doing in Ghent – other than drinking beer??? Joanna – I love it, a bloggers food outing to Ghent. Sophie – ahh and there was me thinking it was some highly exotic ingredient. Thanks for letting me know. Is Brussels not in Flanders too? I wonder why we spell Ghent with an h when you don’t – strange. Chocolette, You have peaked my interest in going to Ghent now. I knew about the city promoting vegetarian cuisine once a week, so it was really good to read that it is an on-going initiative and not just a one off. I absolutely adore those Ghent cuberdons, they remind me of the masks hanging from the ceiling at a Glasgow Museum. Just edible. Yum – rapsberry too – so seasonal. wow lovely post, it is inviting me to Ghent, not only for chocolate but for others tooo….glad you had great fun! Phew what a holiday – can I come next year!!! Thank you for sharing those japanese inspired chocolates. I love the idea of the plain envelope. You are right – it matches the chocolates perfectly. MangoCheeks – certainly a good place to go for vegetarians, but i particularly liked the way the whole city is involved. Shh, don’t tell anyone, but those cuberdons were my favourite thing in Ghent. Ananda – thank you, it’s a very interesting city. I would be interested to see what Finland was like. I imagine their cities to be architecturally nice, but I don’t really know. Gillian – there would certainly be plenty of chocolate inspiration for you. Glad you’re with me on the Japanese wrapping. Awesome post. I think I need to go to Ghent now. What a beautiful looking city! Those chocolates look amazing, combinations that had my jaw a little slack and perhaps a little drool. Gorgeous presentation as well. Sounds like a wonderful time away. Great post, very interesting! The chocolate shops and beer, fantastic! And the B&B sounds so nice. I loved our visit to Belgium and this brought back great memories. Thanks for the wonderful post! CityHippy – I don’t go away very often, so when I do, I go around with wide eyed enthusiasm at all the marvels I see. It can’t just be me though, I’ve heard from several sources now that Ghent is a particularly interesting city to visit. Pam – thank you. Where did you go in Belgium? How lucky you are to have visited such a lovely and delicious looking place. Too bad about the exchange rate as I can imagine you would have loved to indulge in even more…I know I would. Looks fabulous, I really want to go now – architecture plus chocolates plus plants, my sort of trip. Bridgett – yes I guess it’s just a hop across the channel for us, though it’s many years since I last made the hop. Oxslip – neither of us are city lovers, but we found plenty there to keep us happy. and what a place to get greedy in! I am jealous, all those lovely chocolates! all those delicious treats look so mouthwatering. Did you get to sample a few before you made your decision? Peasepudding – indeed it would have been very hard not to have been greedy. Nic – That might have been asking a bit too much – sight and description were enough. This article brings back lots of happy memories. I have been to Ghent twice. A really beautiful city. Fab pictures. I like the Ghent cuberdons. Ghent looks really romantic. Love the photos and the review thanks!